Great for guitar and bass. 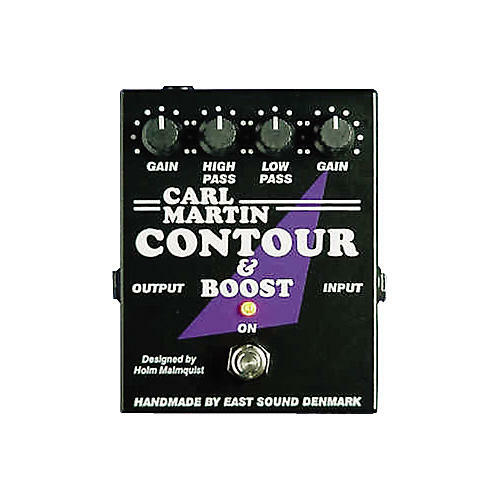 The versatile Carl Martin Contour & Boost is an effects pedal designed to boost and change the contour of your guitar's sound. The Contour & Boost pedal's circuitry is designed with high- and low-pass filters with a fixed crossover frequency at 440Hz. The high-pass filter operates from 65Hz to 440Hz and the low-pass filter from 440Hz to 8kHz. Both filters are individually sweepable with a boost range of up to 12dB. Use these 2 filters to change the contour in any way your creativity inspires you. The Carl Martin Contour & Boost guitar pedal features a built-in regulated power supply.